These are both very insightful looks into how the players who can win consistently at this highly random game achieve their results. This looks super interesting! Though I worry I'm about to go 'through the looking glass'. After playing the actual card game with Evan on Monday I have succumbed and downloaded it. I think I prefer it to dominion. I have Cthulhu Realms, which is apparently not just a reskin but has been tweaked a bit and there are fewer suits so it's more combotastic. Not having played Star Realms much I couldn't say how much difference there is. PaulG wrote: Yes, I'm looking forward to Colony Wars too! I was wondering, when it comes out, whether I'll want to play with everything mixed together or play with smaller combinations of sets. I wonder if ending up with 100ish different cards in the trade deck makes things too random and difficult to make a coherent strategy? Or whether it just makes things more fun as you've got more disruption to your plans? It's a good question. It's been designed so you can play it as a standalone game, so I assume it has been balanced that way also, and I'd like to play it that way at least to start with. I can certainly imagine playing with a six-inch tall deck that includes everything could be a shambles. Aneurin wrote: After playing the actual card game with Evan on Monday I have succumbed and downloaded it. I think I prefer it to dominion. "Colony Wars makes it's galactic debut. Colony Wars is an all new stand alone expansion for Star Realms. This 128 card set features an all-new 80 card trade deck, and also comes with Authority Cards, Scouts, Vipers and Explorers, so it can be played as a standalone two-player game. You can also combine it with the original Star Realms for a 2-4 player game." Lots of possibilities to mix and match, anyway. Very interested in seeing how it differs to the base game! BeardyTom wrote: I have Cthulhu Realms, which is apparently not just a reskin but has been tweaked a bit and there are fewer suits so it's more combotastic. Not having played Star Realms much I couldn't say how much difference there is. I also heard that the starting hand is a bit more interesting than in Star Realms. Would be very interested in playing it some time! Star Realms... Isn’t that the name of a knock off movie from made by The Asylum? Surely this cheap little box couldn’t compete with the other deckbuilding games I had just started to love when this game was released... fortunately, even I am wrong on occasion. Yep, I think I'm in agreement with you here. I've only played the digital version of Ascension, and like it but found the aesthetic very unsatisfying. 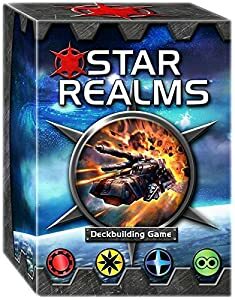 I'm also a fan of Dominion, and don't get to play it enough (I have a lot of sets) but I do find the theme of Star Realms (as generic as it may be) a bit more engaging. I've finally got round to getting the app. I've now got slightly obsessed. My username is nordloc if anyone wants a game. BeardyTom wrote: I've finally got round to getting the app. I've now got slightly obsessed. I think pretty much any other draw for you on that last hand would have kept you alive and I'd have been struggling. Anyway, as I'm now at 100% against the top player in the league, that makes me the best player at the club, right? And after a few more games, I am now officially not the best player at the club. BeardyTom wrote: And after a few more games, I am now officially not the best player at the club. Your reign was brief but glorious. I got Star Realms United (latest expansion, mostly adds dual-faction cards) in the post today, along with a copy of Hero Realms. I'll probably bring it to the next few club sessions if anyone wants to try even more card combinations (and/or give Hero Realms a go). A new Star Realms Kickstarter is live! I particularly like the sound of the commanders, who each have their own unique starting hand as well as different starting authority and hand size. I'm backing this, obviously. If anyone else is interested then let me know and we can combine shipping (shipping is the same for up to 10 sets of rewards). Pretty certain I'll be getting on this, but its a fair jump in price to add the commander decks - not sure which way to go, the commanders do sound interesting. Do you know if the combined shipping only works with multiple copies of the same pledge? AndyH wrote: Pretty certain I'll be getting on this, but its a fair jump in price to add the commander decks - not sure which way to go, the commanders do sound interesting.